Posted is the “Dessert” painting in progress. For the ‘madam’ and ’waiter’ figures as well as the wood ‘wainscot’ I have laid in the undercoats of paint. Beyond that, my emphasis has been on the ’wallpaper’ build-up of colors. 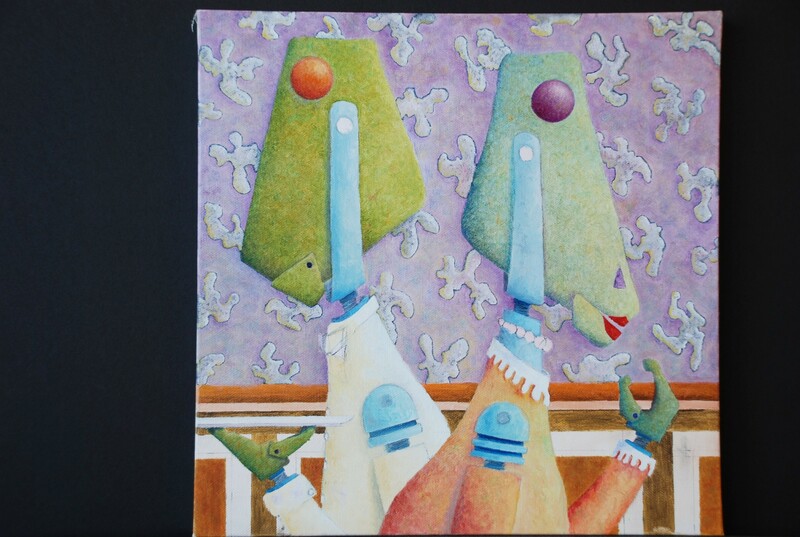 My intent is to keep the ‘wallpaper’ colors soft or muted so that a sense of depth is achieved by the contrast of the brighter colors on the ‘figures’ and ‘still to be painted desserts’. I guess once the finished painting is posted next Monday, it will be up to the viewer to decide if I succeeded. Thanks Sherry, still a ways to go though. You already have succeeded! It’s marvelous! Thanks Claudia, still work to be done, wallpaper gets a couple more glaze coats.